You can always find issues of The Montage in the newsletter section of the mdha.ca website! The early bird registration deadline for the MDA Convention, which will be held January 27th and 28th, 2017, is December 15th, only two weeks away! It sounds like it is going to be another great event with close to 100 exhibitors participating in the trade show. 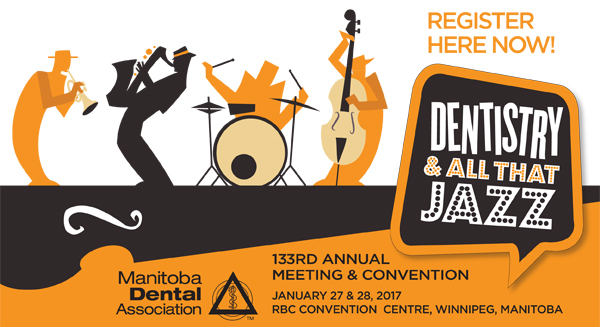 For a full list of exhibitors please visit the MDA website,https://www.manitobadentist.ca/registrations/tradeshow.cfm. The MDHA will be hosting a Mix and Mingle networking event from 8:30 – 9:30 a.m. on January 27th, which is designed to give MDHA members the opportunity to connect with colleagues from around the province, as well as with the MDHA Board of Directors and staff. Immediately following the networking event, at 10 a.m., Dr. Wenche Borgnakke will be presenting on Oral Systemic and Periodontics and Diabetes. To view the full list of presenters, please click on this link,https://www.manitobadentist.ca/registrations/speakers.cfm. All MDHA members are welcome to attend our Mix and Mingle event, however, you must be registered for the full convention in order to visit the trade show and attend the lectures. If you do not have a registered attendee badge, you will not be eligible to enter the trade show, nor attend any of the presentations, including Dr. Borgnakke’s. To take advantage of the special MDHA member pricing and the early bird registration fee of $125, please register on or before December 15th. After December 15th, the price increases to $150 and if you register at the door the day of the convention the fee will be $175.00. Please note that the MDHA will not be serving breakfast during the networking session. Please visit the trade show where a continental style breakfast will be served. Feel free to bring your coffee and a muffin with you to the MDHA Mix and Mingle event. Remember that you must be registered for the convention to enter the trade show and presentations.